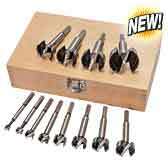 Quickly lock bits into position for maintenance and bearing changes. 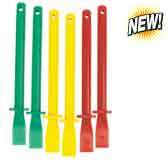 Spread glue over broad areas or into tight spaces with paddle, brush and spreader. 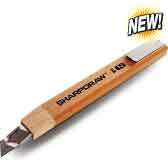 Razor sharp graphite Carbon Fiber 9mm pencil lead never needs sharpening. 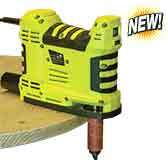 A Multi-Function sanding tool with replaceable discs. 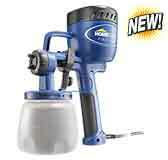 Tackle small sanding projects with ease! 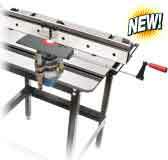 For slabs and boards that are too wide for your planer. 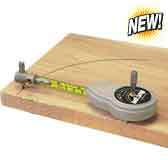 Make your own slab flattening jig. 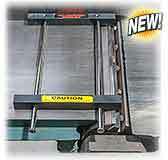 Safely cut tenons and custom	profiles in the vertical position! 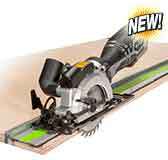 Designed for use on most router tables and table saws. Stay above the table. Save your back! Improved connectivity. No more wires above table. Improved App functions. Small, powerful and portable. 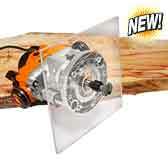 Includes a 4-1/2" track saw with 110" of track 2 blades and clamps. Cuts up to 1-3/4" stock. 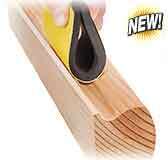 An obstruction free guide fence for routing and sawing and more. 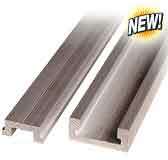 Lightweight aluminum extrusion is straight and strong. Don't let wet wood destroy your hard work! 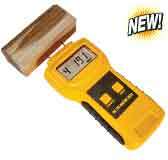 Measures moisture content of any lumber (including fabricated woods). 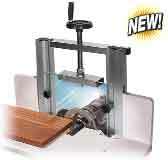 Easily gauge the angle on your chisels and hand plane blades to properly set your sharpening jig. Angles are clearly marked. 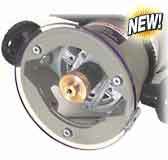 Don't reach under the table to adjust your variable speed router. 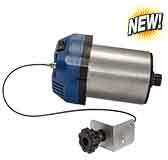 This remote variable speed knob is a simple solution. For applying glue or working with thick paint to create special patterns. Flexible tip can apply various amounts of pressure. The world's fastest profile scriber. 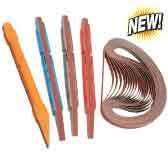 Five different sizes of interchangeable tracing wheels hold your pencil stable. 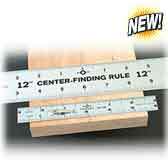 Aluminum centering rules accurately locate the exact center between any two points. Includes 6" x 3/4", 12" x 1-3/4", and 24" x 1-3/4" Rules. 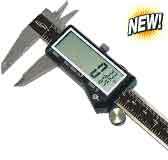 Digital Fractional Caliper 3 Way / 6"
Hardened stainless steel 6" caliper has a large LCD readout and is fast and accurate to 1/128", 0.01 mm and 0.0005". 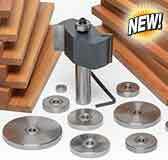 Draw 3-1/2" to 72" radius. 6 ft. locking tape retracts into the body. 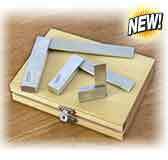 Steel, precision squares are accurate to within 0.001" and come in 2", 4" and 6" lengths. Scribe, score, layout and trace. Double beveled tip for left and right handed operations while the hardwood handle has a firm, comfortable grip. 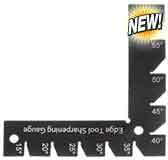 Upgrade your jigs and fixtures! 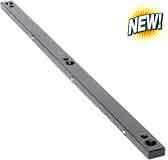 Heavy duty 18" precision miter bar fits standard miter slots. 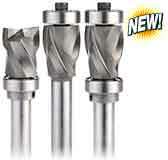 Stock up on the most popular twist and brad point drill bit sizes. Custom heavy duy case. Two jaw sets for the popular vises. 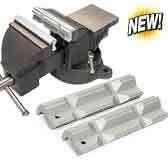 Aluminum Vise V-Jaws or Rubber Pad Jaws. 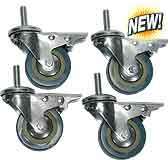 Set of 4 swivel and locking heavy duty casters designed for MLCS Pro Router Table Stand. 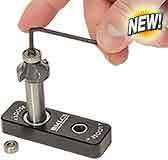 Change the ball bearing guide to achieve 10 different depths of cut. 1/2" shank, carbide tipped. Specifically made for wood. Design better knock down furniture. 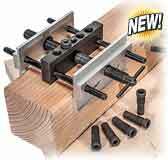 Build robust jigs. FREE SHIPPING! 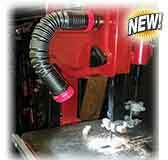 Large 24" x 32" cast-iron top surface supports the largest workpiece. Hand hold in tight spaces or bench mount. 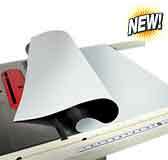 Includes 4 sizes sanding sleeves. Ultimate control of spray pattern. Spray wide or fine, three spray tips are included. 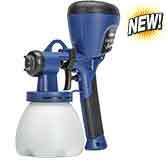 This fine finish sprayer will paint anything with pro results! Refinish and refresh furniture. 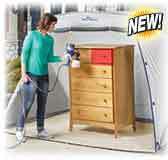 Reduce project overspray paint and stain drift with Spray Shelters. Available in two sizes. 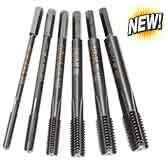 Production quality T-10 high carbon steel hex shank bits have a longer life. Limited quantities. Create a unique Dog Bone bowl with your router and this durable, non-warp acrylic template. A complete routing system featuring the U-Turn Lift, Phenolic Top, X1 Fence and more. The ultimate template routing solution. Compression spiral and bearing design. New and improved design has replaceable inserts. 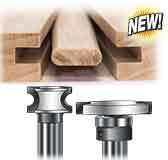 Add strength and beauty to your joinery. 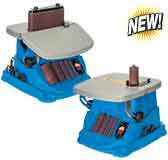 Protect cast-iron or steel tables from spills and corrosion. Scroll Saw and Drill Press versions. 3/8" thick, with quick change insert ring. 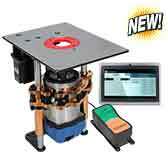 Fits all MLCS router tables that use a plate. Two sanders in one! 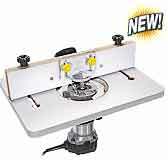 Dual purpose benchtop converts from belt to spindle. 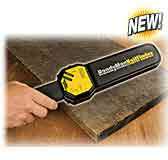 The flexible and soft silicone bench mat is non-skid to hold your work securely in place. Save saw, planer and jointer blades by locating metal objects in the wood before cutting. 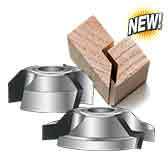 Two piece set makes a 45° miter rabbet joint for a larger glue surface area. 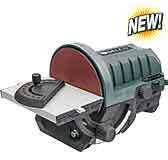 Precisely set jointer knives to within 0.001" accuracy. 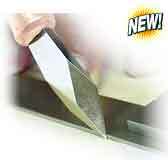 Works with knives up 8" wide. 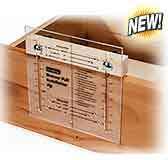 Large acrylic base with angled handles for trim routers. Pre-drilled for the Rocky 30. 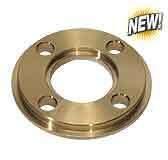 Solid Brass template for Rocky 30 Plunge Base allows use of standard guide bushings. 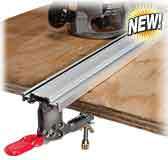 48" T-Bar can be used to make sliding jigs and other fixtures throughout your shop. With three applicator tips: straight tip for wide slots, a biscuit tip, and a wide rubber roller. This multi-function tool with replaceable belts sands the finest details. Many grit options. 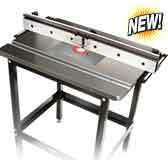 This cutting guide will easily handle large sheet goods. Two 55" long connected extrusions. Increase the versatility of your Rocky 30. 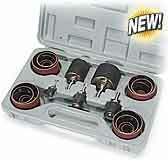 See Rocky 30 fixed and plunge base package! 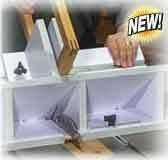 Attach magnetically, wrap, clamp, hang. 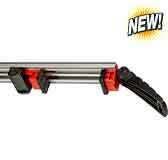 Flex tube expands from 9.5" to 22". Holds shape. Routing wide stock flat is more stable than ever! New, full extruded aluminum structure. Create, replace or repair hardwood flooring. 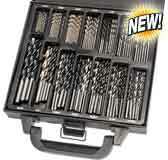 Includes bull nose and slot cutter bits. 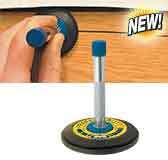 Durable, flexible, rubber grips easily sands contours, curves and profiles on moldings, etc. 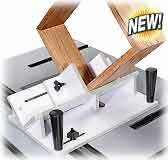 This marking jig makes drawer pull installation easy. Works with five different sizes. No special adapters required! 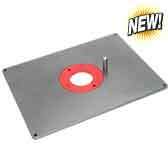 Sub bases can be easily mounted to any brand router. 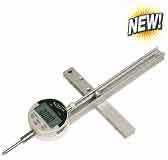 Get accurate measurements on any machine with a standard 3/8" x 3/4" miter slot. Wide Capacity! Anodized aluminum body withsteel guides. Use material from 1/4" to 6" thick. With router plate, fence and dust port. Designed to work with the Rocky 30 router. 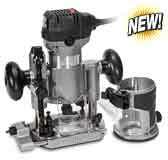 Turn your drill press into a spindle sander our use in a hand drill. Case included. 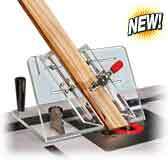 Create strong, decorative spline joints on a router table that has a miter slot.